Developing blogging skills is a slow process. What you need is to work on your technique continuously and you will attract readers. Take in readers critiques for they know best how well you are passing on your thoughts. Neglecting the editing aspect of blogging will deter your readers from your blog. 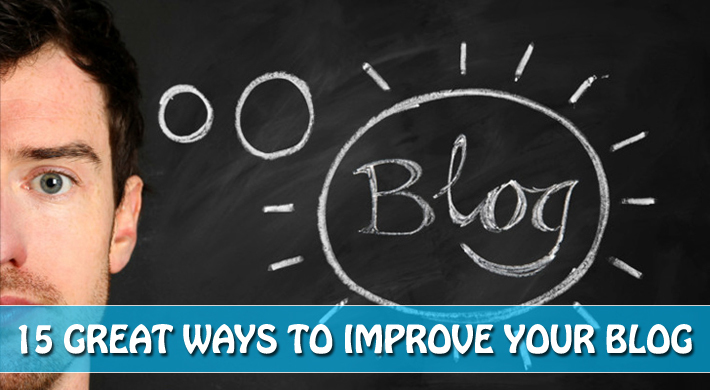 Here are 15 great tips to improve your blog from newbie to PRO. When you are starting to blog, you should go for the best blogging platform that is WordPress. Why we recommend WordPress to you is because of its many brilliant qualities. WordPress is an open source blogging tool and content management system that is easy to use for building websites. It is not like HTML Coding and Dreamweaver in which one has to practice a lot for building a blog. Also, WordPress blogs fetch higher rankings on search engines than Tumblr, Google Blogger and other platforms which lead to more traffic for your content. WordPress is SEO-friendly, easy to use and is the best platform for building informative portals. It has so many plugins that help you in easy optimization of your blog. You can use WordPress SEO by Yoast plugin for doing SEO. SEOPressor is the best plugin for knowing the exact SEO score of your blog post. This will help you in getting good rankings for a particular keyword on search engines. Another blog tip that you need to follow is adding a professional theme on your WordPress blog. There are lots of themes available in WordPress. You can go for Swift Basic which is free, or you can go for Thesis or Genesis Frameworks which are paid. We generally suggest these themes because they have more features and they take less time to load the page. People and search engines love sites that load quicker than others. You should customize 404 error pages in such a way that it looks appealing to your blog visitor in case your visitor gets it. If a person gets a 404 error page then he/she should click on another link in your blog instead of closing your blog’s window and searching for other site. This will help in decreasing the bounce rate of your blog and prevent you from losing precious traffic. There are so many social sharing plugins available on WordPress. Your blog readers will never share the blog posts on social networks if you don’t add social sharing buttons on your blog. Social sharing buttons improve blog traffic and they can even increase your blog’s search ranking. When you start to blog, you should install Google Analytics to see your blog stats. You can sign in easily on Google Analytics using your Gmail ID. Through the Analytics report, you can see where visitors are landing on your blog and also from where they are coming. You can see which keywords are doing good for your blog and you can target that particular audience. Google Analytics has so many features and is considered as the best tool for getting to know more about the source of traffic coming to your blog and you can also track conversions. So, you should see the flow of your blog’s traffic in detail and schedule blog posts accordingly. Connect your Google Analytic account to Google Webmaster Tools for even more insights about your traffic. Without content, you can’t do anything in blogging. If you want to make your blog popular, then you need to produce quality content every time you publish the post. Writing quality blog posts is not an easy task. It requires good writing skills and you must have good knowledge and expertise on a particular topic. This will help your readers to gain a better understanding of your topic. And people will be coming back to your blog which is a positive sign and a sure way to increase traffic. Keyword research is one of the most essential technique in the search engine marketing. This can help your blog to gain more organic traffic from search engines. People do search for those terms that come first in the “Google Search Suggestion”. If you add those keywords for your blog posts, then you can get more blog traffic than normal. You can check the keyword popularity on the Google AdWords Keyword Tool or use a paid tool like Market Samurai. These tools will give information about monthly searches of each and every term and you can put accordingly. This will help you in getting right kind of visitors or targeted traffic on your site. Guest posting is the most brilliant way to drive traffic from other blogs. You can write on some popular blogs for increasing your blog traffic. In real estate, location matters a lot to a buyer. Similarly, the location of your content matters as well. If your blog post gets accepted on a popular blog, then you will be getting familiar with new people. This will help you gain authority and thus your blog traffic will increase. Same way, you should also accept guest posts on your blog. The writer will be sharing that blog post on his/her social networks and you will be meeting new blog visitors. There are lots of benefits of daily blog commenting. You should comment on different blogs of the same niche for getting more blog visitors. Also, try to leave the first comment on other’s blog posts. People do check out the blog of the first commentator. Whenever you start to blog there is a topic or a purpose which you feel to share with others. Generally people keep switching topics which deviates the readers from the actual discussion. There always have to keep in mind that you stick on to a single topic or a purpose which will help your readers to focus on your thoughts and as well as give them the platform to comment. Focus on creating a resource that does the job of a reporter to make their lives easier. Reporters are more likely to use your post to explain a facet of what they’re reporting on if they can simply point to your article. Be very consistent with your blogging. Make it a habit to post everyday so that you don’t lose your readers. Choose a publishing schedule that is realistic for your schedule and that fits your audience. It might be once a week, everyday, etc. Whatever you decide, make use of scheduling features in WordPress or your CMS and publish content consistently. Maybe it’s because this piece takes an extra bit of effort, but so many bloggers don’t use images well or at all. In a way, you always have to curate your own photos or graphics along the way. Make sure you have personal, engaging photos to go along with your posts. Always video is the best option for pulling the eyes of your readers. They happen to not only read your words but actually also witness the action which generates feelings and people join more. Also last but not the least here are 10 helpful tactics to build your audience for your blog nice and steady. The guys at Green Pal have done a great job to put together this Whiteboard Friday from Moz. I hope that these tips would really be helpful in guiding you to improve your blog wherein we would also love to have your feedback and take on this.